Tetanus is an endemic disease but an uncommon diagnosis in cattle in the Katherine region, where cattle are generally not vaccinated. This report describes two cases from a well-run property where the inciting cause for the infection is not known. 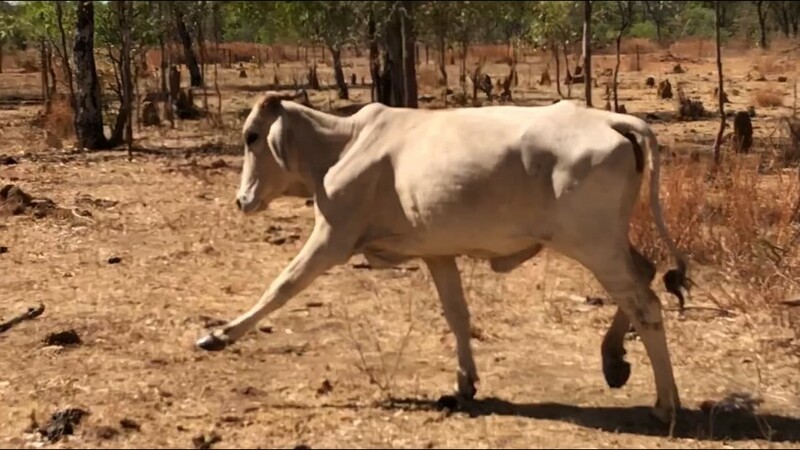 Two animals from different paddocks (One male 31 months old, single dose of 5-in-1 vaccine at six months old, one female 14 months old, never vaccinated) were seen with a staggering gait over several weeks; clinical signs progressed in the steer to paresis and collapse. This animal was euthanased and a post mortem examination performed. Clinical signs in this animal included a locked jaw and prolapsed third eyelid in the right eye only. There were no other significant gross post mortem findings apart from impaction of the abomasum and reticulum with dry plant matter; the gastro-intestinal tract was relatively empty, indicating that the animal had been unable to eat or drink in the previous day or two. Samples were submitted to the Berrimah Veterinary Laboratory (BVL) for transmissble spongiform encephalopathies (TSE) exclusion, on the grounds of neurological signs and collapse. The heifer was observed in the paddock. She was able to graze and swallow at the time the property was visited. A spastic, uncoordinated gait was noted when the animal was prompted to move, with hyper-extension in some movements and generalised neck and trunk stiffness (see Figure 17). The property owner/manager reported that the gait of the heifer was very similar to that which had been observed in the euthanased steer. Examination of the brain and spinal cord found no evidence of TSE or other significant central nervous system pathology. There were no abnormal findings in the other internal organs submitted (lung, spleen, heart, liver, kidney), and hypomagnesemia, lead toxicity and BHV5 were ruled out on serum chemistry. Serum biochemistry showed azotaemia, consistent with dehydration owing to recumbency and inanition over at least the previous 24hrs. The most significant findings were extremely high levels of creatine kinase (CK) and aspartate aminotransferase (AST) (see table 4); this result indicates severe muscle damage, much more than would typically be expected of a downer animal. Extremely high levels of CK are seen in a limited number of conditions: tetanus and other causes of seizure or increased muscle activity, black and brown snake bites (King Brown or Mulga snakes in particular), or as a result of prolonged exercise (also called exertional rhabdomyolysis or capture myopathy, which results from being chased or hunted). The last two possibilities are considered highly unlikely; snake bite is considered unlikely because of the duration of symptoms (snake bite symptoms develop very rapidly after a bite, not over several weeks) and the rarity of snake bite in cattle, while exertional rhabdomyolysis is not likely given the historical management of these animals. There is nothing to suggest recent chasing or extreme stress in this case history. Tetanus in cattle is well described, and a diagnosis is generally made on the basis of clinical signs (spasms, tetanic gait, collapse) and supporting laboratory evidence. This case is highly unusual, in that tetanus cases are commonly seen in young, unvaccinated cattle, shortly after de-horning and/or castration, and often as a result of poor hygiene practices and/or subsequent holding of cattle with open wounds in dirty yards. Tetanus in adult animals without a recent history of injury or management procedures is rare. However, Hungerford et al reports an outbreak of tetanus in weaners in 1964, where “48 yearling heifers were depastured on straw which caused a certain amount of gastric irritation.” The animals developed tetanus, and Hungerford goes on to report “it is postulated that, under certain circumstances, conditions in the bovine stomach may favour growth of Clostridium tetani with the production of toxin.” Since tetanus in adult animals is generally sporadic and isolated, it is also considered highly unusual to see two animals in the same time period with similar signs, and from different paddocks. The dry tropical feed available could be considered likely to be capable of causing gastrointestinal damage. Other small penetrating injuries are possible but were not observed. The surviving heifer has been treated with procaine penicillin, and has been yarded for observation and nursing care. The producer reports that the animal is slowly improving. Based on available literature, it is anticipated that a recovery from clinical signs may be effected within 3 months. The question is; how much does this disease contribute to background mortality in non-immune cattle? Hungerford’s Diseases of Livestock, Ninth Edition (T.G.Hungerford et al, 1990), p. 307-309.